Putt's Law and the Successful Technocrat is a book, credited to the pseudonym Archibald Putt, published in 1981. An updated edition, subtitled How to Win in the Information Age, was published by Wiley-IEEE Press in 2006. The book is based upon a series of articles published in Research/Development Magazine in 1976 and 1977. It proposes Putt's Law and Putt's Corollary which are principles of negative selection similar to The Dilbert principle by Scott Adams proposed in the 1990s. Putt's law is sometimes grouped together with the Peter principle, Parkinson's Law and Stephen Potter's Gamesmanship series as "P-literature". Putt's Law: "Technology is dominated by two types of people, those who understand what they do not manage and those who manage what they do not understand." ^ Archibald Putt. Putt's Law and the Successful Technocrat: How to Win in the Information Age, Wiley-IEEE Press (2006), ISBN 0-471-71422-4. Preface. ^ John Walker (October 1981). "Review of Putt's Law and the Successful Technocrat". New Scientist: 52. ^ a b Archibald Putt. 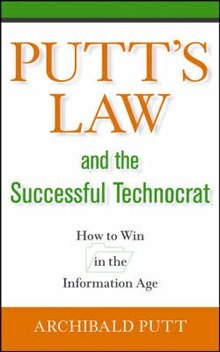 Putt's Law and the Successful Technocrat: How to Win in the Information Age, Wiley-IEEE Press (2006), ISBN 0-471-71422-4. page 7. This article about a book on management is a stub. You can help Wikipedia by expanding it.